These make a great family or party meal. It’s quick to prepare and everyone can help themselves and assemble their own tortilla. The coating uses natural yoghurt instead of the more traditional egg which gives a nice sourness to the chicken. The chicken is then baked instead of fried so that it remains relatively healthy. Two chicken supremes will be enough for 4 people having 2 tortillas each. Set the oven to 200°C. 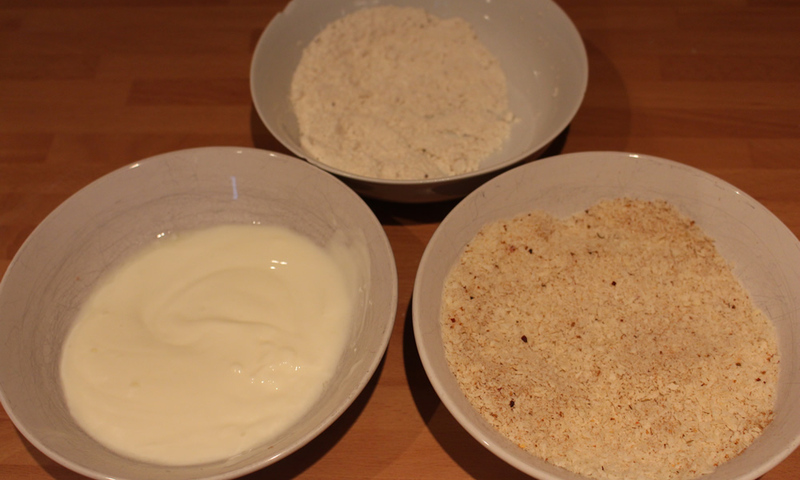 In 3 separate bowls put the flour (seasoned with a little salt and pepper), natural yoghurt and breadcrumbs. Add a couple of pinches of paprika to the breadcrumbs and mix well. Slice the chicken supremes into goujons. In small batches coat the chicken in the flour, then the natural yogurt and finally the breadcrumbs. 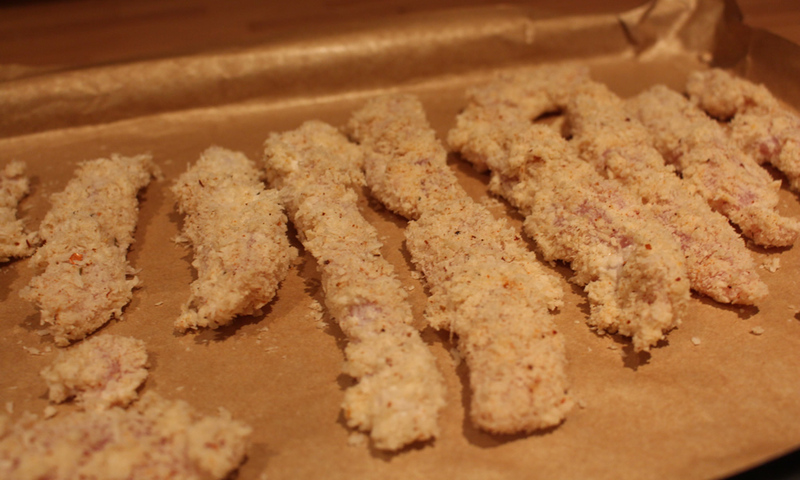 Lay the breaded chicken strips on a foil lined baking tray. Repeat in batches until all the chicken has been coated. Bake in the oven for 20 minutes. Top Tip: Wash your hands in between finishing each batch as the coating will start to cover your fingers instead of the chicken. While the chicken is baking, prepare the natural yoghurt sauce. In a bowl add all the ingredient and mix well. Feel free to adjust the quantities to suit your own tastes. About 5 minutes before the chicken is ready, it’s time to warm the tortillas. Put a frying pan on a medium heat and when hot cook the tortillas on each side for thirty seconds to a minute. Place the warm tortillas in a clean dish cloth to keep warm while you cook the rest. When the chicken is ready take all of the ingredients to the table where everyone can prepare their tortillas to their own tastes. You can add other ingredients to the tortillas such as sliced red onion, tomatoes or peppers. 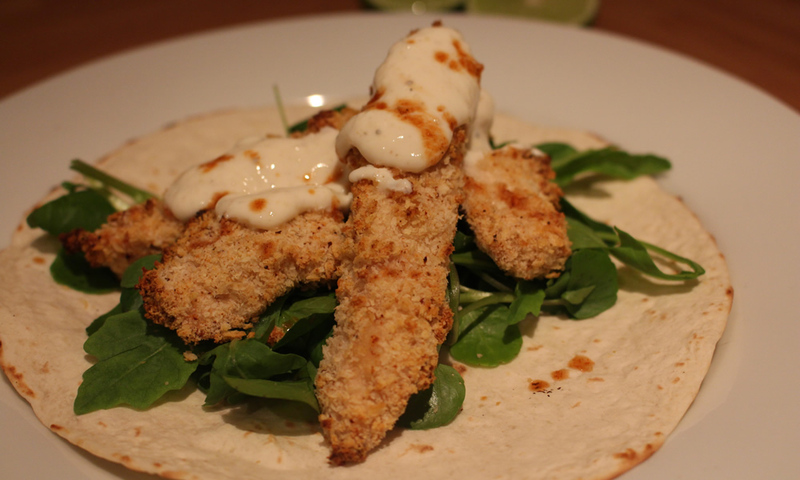 This time (pictured) I used watercress, rocket, the yoghurt dip, chilli sauce and a squeeze of lime.